Has anyone else but me noticed the increase in cyclist these days? I see more and more people riding their bikes as a way to commute to work with every year that passes. This is a good thing for anyone who does. We all agree that exercise is a good way to stay fit. Cycling to work brings good health because your body is getting a dosage of physical activity that stimulates the heart and muscles. Because most of us can’t seem to find the time to go to a gym on a regular basis, cycling to work is a great way to get your exercise in routinely. In fact, you won’t even have to plan a workout schedule because this is something you are going to do every week and that’s going to work. In an earlier post, I talked about how utilizing your bike to do different things that you normally would drive to do is a great way to get some exercise without it feeling like you are setting out to exercise. This could psychologically make it easier to get that daily dose of exercise inadvertently. Your body is like a machine. 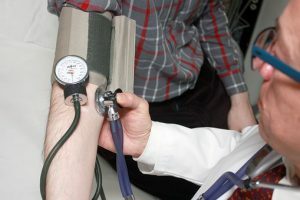 You keep it tuned up and it functions better than if you don’t do anything to stimulate your heart, muscles, blood flow and your cardiovascular system. As we go through the years of aging these functions can deteriorate and not perform as well. Much like just sitting there getting rusty. Cycling actually reduces a lot of things that can give you health problems if you cycle pretty regularly. There are many state & government agencies who have spoken out on just what cycling can do for your health. There are a lot of potential health risk diseases that can be avoided such as heart attacks, strokes, diabetes, arthritis, obesity, high cholesterol and cardiovascular disease. The great thing is that it is a low-impact exercise so it will help the joints especially for us who are a little up in age. And for the younger crowd, it will help preserve those joints for when you do age. I am sure you have nothing against keeping your body healthy but if you are like me you have no problem with saving money when you can. Just think about how much less you would have to go to the gas station to fill up the old automobile and how much you will cut down on car servicing and repairs. Bicycles are low end and high end in cost. But they all do the same thing. You don’t have to go out and spend a fortune to get a bicycle. 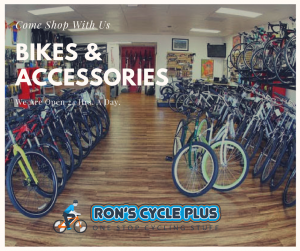 While you are here have a look at Rons Cycle Plus and go to the shop now tab in the menu for some very affordable prices on bicycles. You can get healthy with bike riding by riding to work, ride solo, ride with friends or family or ride for weekend adventures. There are various types of bikes you can mold your riding pleasures with. There are regular pedal bikes, e-bikes or tandem bikes and they all will serve as a way of gradually getting healthy. And all of them can be purchased at a reasonable price. You will find that after you ride to work awhile people will start to know you and respect you on the route you ride and that is a good feeling within itself. And your body will appreciate you keeping it tuned up in the process. Then riding your bike to work will just be part of your daily routine and you won’t even think of it as exercising. Thank you for taking the time out to read this post and I hope you can see how bicycling to work will be a great health benefit to you. Please leave any questions or comments in the comments section below. I really enjoyed your article, and I love cycling so much. You are totally right, cycling to work is something that we are seeing more often than before, which really is a great thing. I loved the video about the benefits of cycling. Thank you for sharing. keep up the good work. We need to see more and more people cycling that’s for sure. Thank you for the comment. 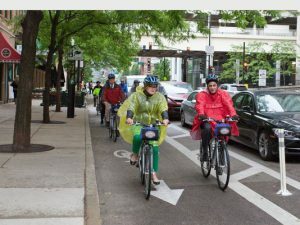 I do believe we will constantly see an increase in bike riders especially sense cities are starting to think of cyclists as they make plans to change their streets by adding riding paths. It makes it safer for everyone and you feel more comfortable riding to and from. I really enjoyed your site as I used to love getting out in the country cycling and traveling. May I ask your view on what bike would be best for long distance cycling? I’m thinking about taking it up again. I always tell a person it is rider preference. I have used a low-end Mongoose bicycle for a long time and it serves me well. Someone else might prefer a different bike. It really depends on the rider I would say. Click here and read this post to see if it helps. Great post, I agree with you that cycling to work is a great way to stay fit and also saves you trips to the gas station and money for gas. I remembered that when I was a kid, my school was very close to my house, and I used to ride my bike with my friends to school and it was a lot of fun. I wish I can still do that now, but my workplace is too far away. But I still occasionally ride my bike. Thank you for sharing. Thank you for visiting. You know if you really want to get into riding to work you can look into e-bikes because they help you still get a workout and allow you to go greater distances with the pedal assisted motors. Click here to take look at this link on one of the bikes that are available. This actually makes me wanna buy a bicycle! I just moved and where I lived before was super hilly and hard to get around anywhere on a bike. So I sold mine. Now that I live somewhere a bit flatter, it’s super doable to bike around. I love what you said about how it becomes a routine exercise — so true! Thanks for sharing! No problem. Sounds like you biked a bit before. That means you know how good it makes your body feel when you do it regularly. There are some nice bikes that you can get and you don’t have to break the bank to do so. Feel free to look around Rons Cycle Plus when you are ready. I can see the health benefits of cycling to work, but for me, I think that it is a bit far. Y work is 30kms away and is a bit hilly in places. Do you think that that is too far and too much to cycle? That is a bit much. But you can use an e-bike if you really want to use a bike to commute to work. There are some people who would take that challenge on. All last year I rode a total of 17 miles to and from work even into the winter months. So the answer is how much do you enjoy cycling?